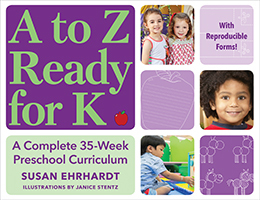 Susan Ehrhardt has thirty years of experience as a pre-K teacher in Cincinnati, Ohio. She has a BS in Education from University of Cincinnati, completed graduate studies in ECE at the University of Cincinnati and in Early Childhood and Special Education from College of Mt. St. Joseph.